There’s a new fashion in town, and it’s called Chamilia. What is Chamilia? Well, it was founded by Killian Rieder and Jeff Julkowski. The name Chamilia is derived from “chameleon,” a lizard known to change its color according to its environment. A great name for an interchangeable jewelry design that can match any individual’s mood and style. Chamilia jewelry includes beads of 14k gold, sterling silver, Swarovski® crystals, Italian Murano glass, and colored stones. Each bead from Chamilia is exquisitely designed. Designers create exclusive designs, which are then modeled by experts. Disney has been working with Chamilia since April 29, 2013. Disney Parks have carried a variety of their interchangeable beads and bracelets for a few years now. 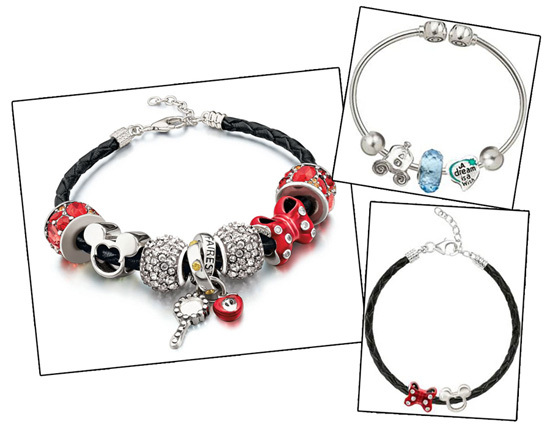 There are Disney Parks-exclusive beads inspired by Disney Princesses and many more of our favorite Disney characters. MyDisneyCloud is proud to be working with some amazing Disney sites and travel agents to bring you the chance to win your very own Disney Chamilia bracelet worth $200!!!!! This entry was posted in General, Giveaways and tagged beads, bow, bracelet, chamilia, cinderella, disney, free, giveaway, interchangeable, jewelry, mickey, minnie, win by My Disney Cloud. Bookmark the permalink. What an amazing giveaway! I am a HUGE Disney fan, and would LOVE to win this!